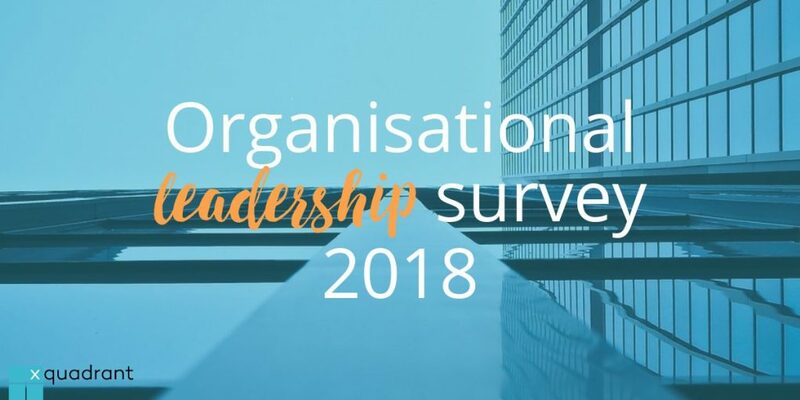 The results are in from xquadrant's 2018 Organisational Leadership Survey. In the spring and summer of 2018 xquadrant surveyed over 150 senior business leaders in order to understand their top business goals and the organisational challenges that were putting the brakes on their ability to execute. >> No time to read this now? Concerned you’ll miss the insights from the rest of the series? Get the entire series in ‘bite sized’ emails + a convenient consolidated report. Our survey focused primarily on senior executives in contexts of rapid change (most notably the tech and digital sector). We had extremely senior engagement. Over 50% of respondents are business owners, founders or C-Level leaders, and almost 30% are senior organisational leaders running a multi-level organisation. The balance are mainly team leaders. We are therefore seeing a real glimpse into senior management preoccupations and concerns. Leaders are operating in high-change contexts. 60% of respondents run tech or digital businesses; a further 25% run tech or digital projects in a more traditional business. So 85% of participants are operating in fast-moving environments where the ability of employees to adapt and move fast is essential. Driving growth is the top focus area. Perhaps unsurprisingly, growth is top of mind for the majority - some 60% - of senior leaders. Transformation is a solid #2. Around a quarter of leaders identified the internal transformation of their organisation as their most strategic priority. Overall the mix of business challenges were similar across sectors – although those undergoing a digital transition are, perhaps unsurprisingly, more preoccupied with internal cultural and operational transformation. 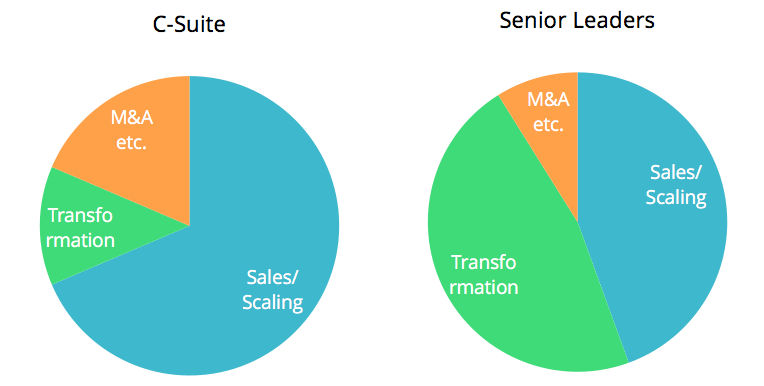 C-Suite leaders are notably more focused on sales and scaling (60+%) than senior organisational leaders (45%), for whom organisational transformation is a more common pre-occupation. Why the difference? We’d suggest that it’s due to the C-Suite being more concerned with the ‘what’ (organisational goals) and the organisational leaders being more focused on the ‘how’ (implementation strategies). The survey also highlighted that larger organisations have very different needs from smaller entities. 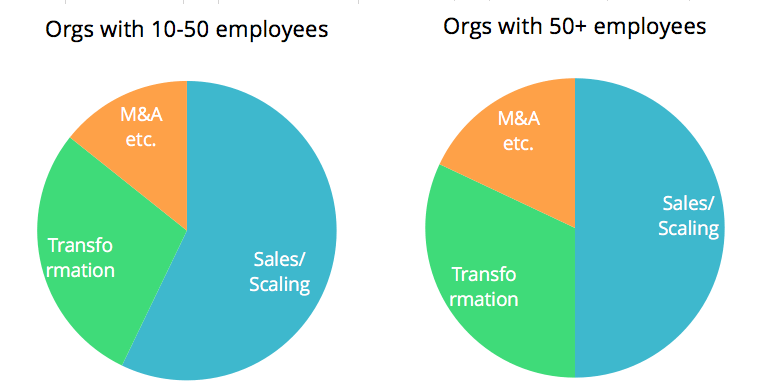 CXOs of larger organisations are notably more focused on M&A activities than those of smaller organisations. And the majority of senior leaders of large organisations are more focused on transformation activities, which is not the case for leaders of smaller organisations. In Part 3 we’ll reveal the specific organisational and people challenges that are holding back sales and scaling, and those holding back transformation and turnaround. And in Part 4, we’ll unearth the strategies that respondents found had the biggest potential to ‘move the needle’, address these issues and move their businesses forward. Richard Medcalf is Founder & CEO of xquadrant. Having held senior positions in both the professional services and hi-tech sector, he's committed himself to improving the quality of leadership and organisational performance around the world. The way to his heart is through curry.